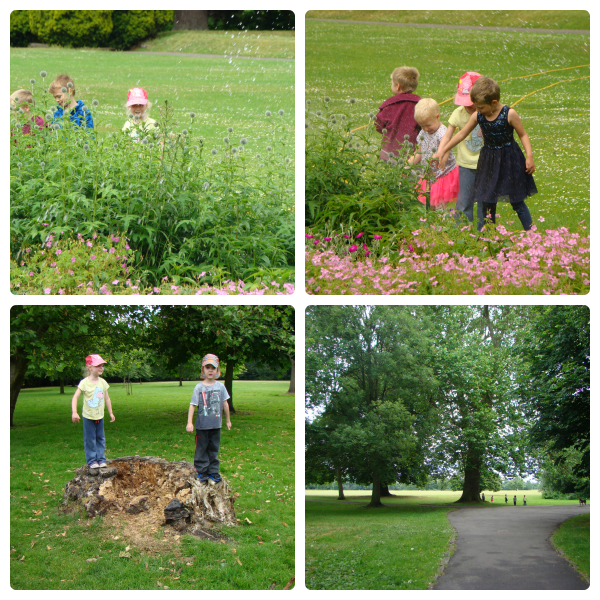 This afternoon we met up with our local home education group and went to a local park. 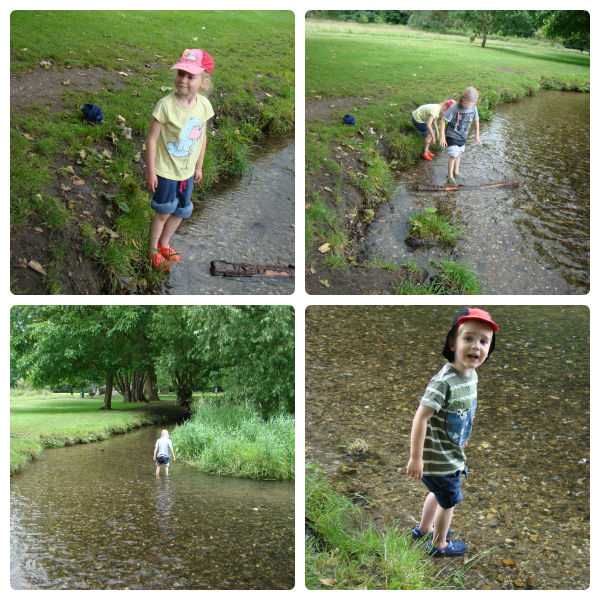 Beddington Park is only a five minute drive from our house and we drive past it often. We have talked about going there often too, but for some reason we never have. So when it was mentioned as somewhere to go today I was quite pleased! I was told there was a place in the river where the kids can paddle and fish. What a perfect activity! So I loaded us up with spare clothes and beach shoes for paddling in, but I was determined to get there on time so I forgot the fishing nets! Luckily someone else had remembered theirs! We had a brilliant time! Somehow all 6 families arrived at almost exactly the same time so we all walked through the park together. The kids played in the sprinklers for a while, and enjoyed exploring the park with their friends. But the best part of the afternoon was the paddling! All 3 kids had been looking forward to going in the river so at the first opportunity they took their trainers and socks off, put beach shoes on and were straight in! I didn’t go in myself but apparently the water was very cold! Ben’s paddling adventure didn’t last long and he decided it was better to stay on dry land. But Thomas and Jasmine were so busy playing and exploring they didn’t notice the temperature. Jasmine spent the entire time we were there fishing. She caught water louse and shrimp, lots of shrimp! 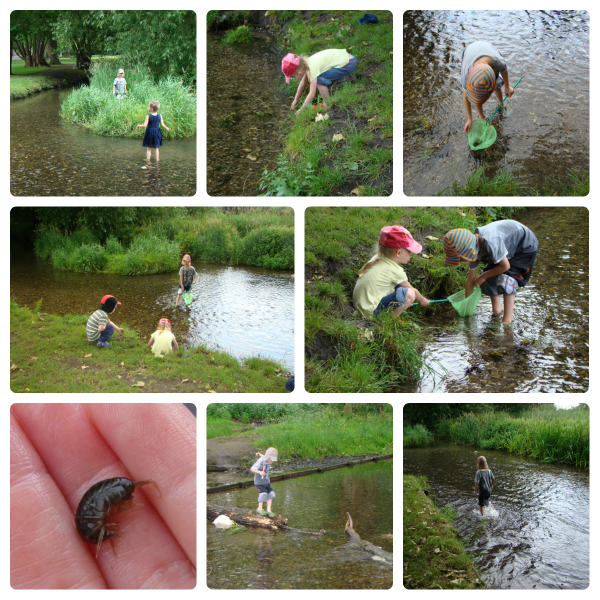 Thomas did some shrimp catching too but he also had great fun wading over to a small island, walking down the river to help build a bridge with some of the other kids, splashing around. He got soaked and he loved it! For a large part of the afternoon Jasmine stayed close to the side of the river but she kept running out of shrimp to catch! I explained that if she stayed in the same place all the shrimp would run and hide so she would need to move and eventually she did venture further out. She even went on to the island in the end. They had such a fantastic time I’m sure they would have stayed all day if it was possible! But we couldn’t stay all day and so to coax them out of the water we got the bubble wands and bubble mixture out and blew some giant bubbles. 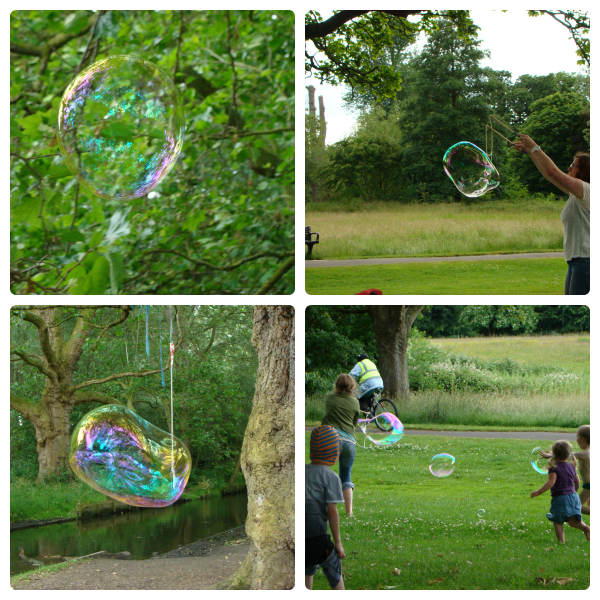 Giant bubbles are great fun and I am sure all the adults enjoy them just as much as the kids. Well, I know I do! But then it was time for us to get dried off and walk back to the car because Jasmine goes to Rainbows on Wednesdays, meaning an early dinner is needed. We said goodbye to all our friends as they went to the cafe for ice cream and as I was packing all the wet clothes in a bag Thomas had a go on the rope swing. He hadn’t been on it all afternoon but as soon as everyone had left he was straight on! He did really well too. He is getting much more confident in his abilities and its really lovely to see. The kids also found a great tree to explore on the way back to the car. 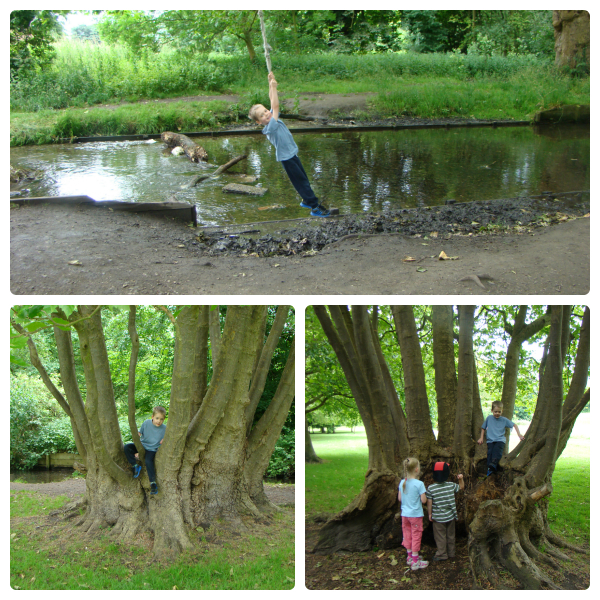 Now I know how much fun there is to be had at Beddington Park we will definitely be going back. I still can’t believe I didn’t know what a wonderful place it is, and right on our doorstep! Glad you found such a wonderful retreat. Looks like everyone had loads of fun! I like Beddington Park too! Jo I love this post, this is just what kids everywhere should be doing. My own can spend hours like this playing down by the river, I find myself hunting all over for them at tea time and there they are along the river bank deep in play. Delighted you have the park so close to home, I don’t think the kids will need asking twice to return! Its great isn’t it, when they can do this 🙂 So may of our rivers nearby are so dirty they can’t go in but this was brilliant! I honestly can’t believe I didn’t know it was there! Being able to wade in the water is such a fun activity. Glad you have found such a great place to explore! Yes, the kids absolutely loved it!